Leaving behind stubble is not ideal when shaving, but it’s a good practice to leave behind crop “stubble” after harvest. According to soil scientist Frank Larney, crop residue anchors the soil against wind and water erosion. Avoiding bare soils is one part of a soil conservation package he and his research team demonstrate in a 12-year experiment growing pulses in southern Alberta, Canada. Soil scientist Frank Larney showcases his work at a field day, which is an open house for farmers and agriculture industry representatives to learn about the latest field research. Photo credit Drusilla Pearson. Pulses are another name for dry beans like pinto, lima, red, and black bean. They are a useful crop for many Alberta farmers. 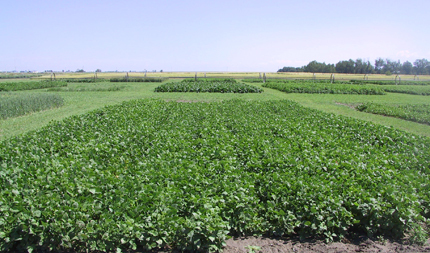 Pulses add nutrient value to the soil. They do this because their roots have soil microbes – bacteria in this case – living in them. The bacteria pull nitrogen from the atmosphere. Nitrogen is an essential compound for most living organisms, and especially plants. Better yet, the bacteria convert the nitrogen to a form the plant can use as a food source. When the pulse plants die and their roots decay, the remaining nitrogen nutrients are released into the soil. These nutrients are available for future crops.Any crop that adds value to the soil is helpful to farmers. 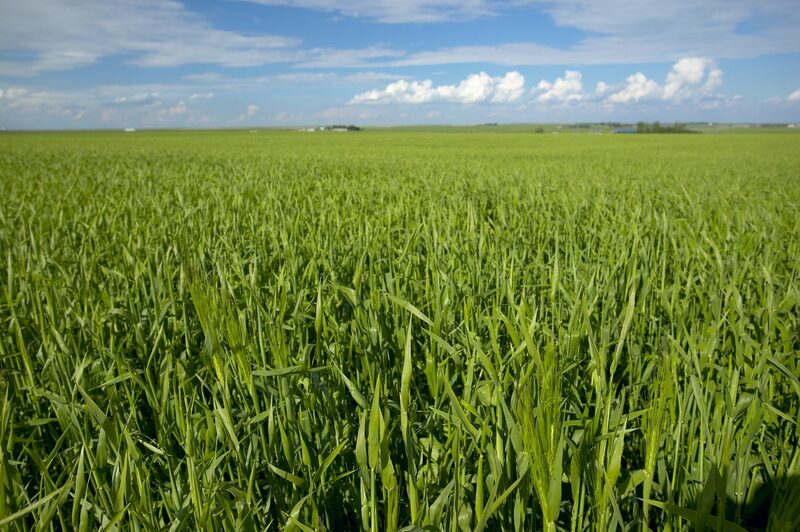 Southern Alberta has a dry climate and much of the prairie land is irrigated and intensely farmed. Left unprotected, soils are vulnerable to erosion. Researchers like Larney are proving that conservation farming techniques can maintain crop yields and at the same time protect against soil degradation. “Soil is a limited resource, and we need to be improving our soil quality, or at least maintaining it, in order to keep growing food,” said Larney. Larney is a researcher with Agriculture and Agri-Food Canada at the Lethbridge Research Centre in Alberta, Canada. Larney and his team practiced the tenets of soil conservation while growing pulses over a 12- year-experiment. The conservation package included reduced-tillage, narrow row cultivation, cover crops, and manure compost to protect and bolster the soil. 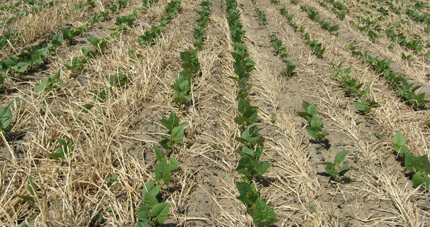 Beans cluster in narrow rows, protecting the soil beneath from erosion. Dry bean adds value to the soil by taking up the plant nutrient nitrogen from the atmosphere and depositing it into the soil for other plants to use. Photo credit Drusilla Pearson. Traditionally, farming in the area relied on tilling. This disturbs the soil and buries leftover stems from the previous bean harvest. As a result, the soil is stripped of its protective cover.“You don’t want to have a bare soil situation because you’re losing moisture, which is very valuable in a semi-arid area for growing crops. And you’re also exposing that surface soil to wind and water erosion,” said Larney. Farmers can also plant dry bean in narrow rows to increase soil protection. Farmers usually plant bean in wide rows, and cultivate between the rows, which works up the soil and increases the risk of erosion. According to Larney, dry bean has now been bred to stand up taller, making them better suited for narrow rows. Larney and his team also planted cover crops. 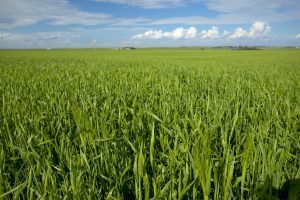 Cover crops are useful for two reasons: They provide a protective cover over the soil through the winter months, and they use up any leftover nitrogen in the soil after harvest. If the soil was bare in winter, water and wind would steadily chip away at it, and might cause the nitrogen to move away. Larney also used manure compost to bolster the organic matter in the soil. Year after year of growing crops can put a strain on organic matter levels. To combat this problem, Larney and his team added manure compost to the fields to try to replace the lost organic matter. Fortunately, southern Alberta has no shortage of manure because of the cattle feedlot industry in the area. Larney and his team had some ups and downs over the 12-year experiment. “When you’re running a field experiment you’re always at the mercy of the weather,” said Larney. The farming itself isn’t easy either. “Just managing all those crops (potato, sugar beet, and soft wheat were grown in rotation with dry bean) and keeping on top of weed and disease control and pest control is essentially a full time job,” he said. Larney’s study was published in Agronomy Journal. The Alberta Pulse Growers contributed funding toward this project. The United Nations Food and Agriculture Organization declared 2016 the International Year of Pulses (IYP). In celebration, the Crop Science Society of America (CSSA) created a web page for the public about pulses, www.crops.org/iyp. Special tabs for the public include K-12 Education, Beans in the News, Grown Your Own, and Delicious Ideas. CSSA has also compiled links to various recipes, so you can increase your consumption of pulses.